Just got back from an entire day of skiing at Elk mountain. I did not get there until around 10:30 and stayed until the very last run at 10 PM. Of course the friggan place was crowded during the day, but by the last three hours before closing, the lift was virtually ski-on. However, the majar bummer is that for night skiing they only have a fraction of thier trails opened. None of the mogul runs were available. One thing I did notice, is that this place definitly seems to cater more to the experienced skiier. For example for night-skiing, all of the available runs where blue or black. There was no green terrain opened. The only green that was opened was the little bunny slope down at the bottom, which did have its own chair lift. Like I mentioned, during the day, the crowds were getting rediculous! I’ve been told that this had to of been one of the most crowded days ever! I wonder if part of it was due to the fact that I-80 was pretty much closed, so people opted to come up to Elk Mountain since it would’ve been easier to get to than any of the areas off of I-80. I would also imagine that after that big snowstorm, everybody decided they had to get out and ski, since the conditions were going to be so good. Also, I had to check out that green cruiser, Lehigh, that runs down around the back side and then dumps back at the top of the beginner’s area. It was actually quite pretty back there (should’ve took a picture back there), but it was pretty narrow in some places. Nothing like going for a nice ride through the forest during the winter. One thing I did notice that I’ve seen a few people, mostly kids on snowboards that where poaching runs through the woods. Believe me, I was tempted, but I was unfamilier with the area and what it was like in the woods. Also, I asked the local ski patrol about that, and they did say it was a big no-no and that they have been yanking people’s passes for doing that. Thus, I opted to stay with the marked runs. BTW, the ski patrol there has been really cool. Of course, I had to drop in for a visit. After a few runs, I had to go in for lunch. Of course, the cafeteria was also a friggan mad-house as well, but the food service folks were doing a great job of getting the people though. Those meatball subs they got there were quite tasty. I enjoyed it so much that I had to get another one for dinner. The fries were also pretty good as well. I opted to just grab water from the self-serve fountain they had there, which was free, thus setting me back “only” about $7 for a sub and fries. Still somewhat pricey, but still pretty reasonable for what you get. Well, tommorrow, Sno Mountain (TSAFKAM - The Ski Area Formerly Known As Montage). I’ll definitly have to visit Elk Mountain again in the future, however, it will not be on a holiday weekend! Enjoyed your report..I’ve always been interested in that ski area. How does the ski area stack up against similar Vert areas like Timberline or Blueknob? Does it feel like a solid 1000 vert? & They have been planting norway Spruces by the thousands for years up there. All I saw in the picks were small ones scattered thru the tree border ares…Were there stands of full grown ones? Enjoyed your report..I’ve always been interested in that ski area. How does the ski area stack up against similar Vert areas like Timberline or Blueknob? 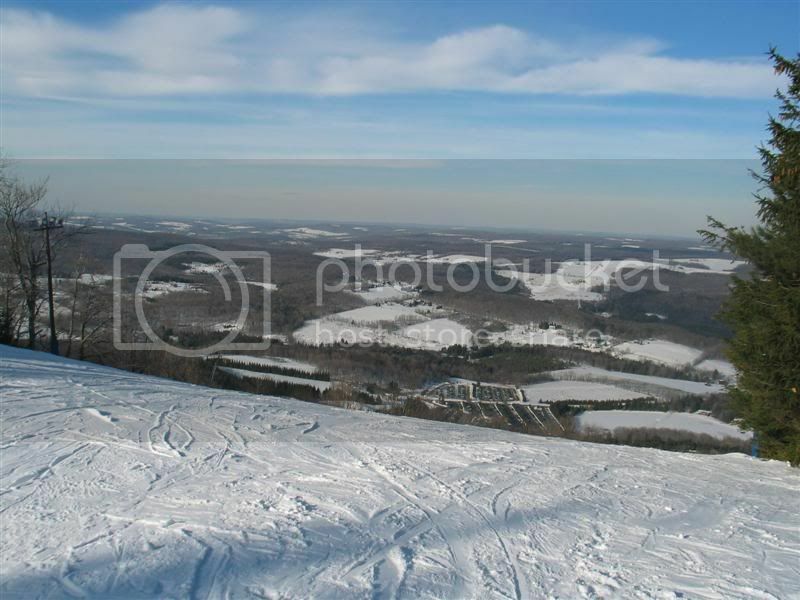 Unfortunatly, I’ve yet to ski Timberline as well as Blueknob, so I cannot really say. However, I did talk to one guy as I was riding up the lift that said that for terrain, it was pretty similiar to Blueknob, but with much better coverage. However, there are no gladed runs at Elk, though. Having just skiied Sno Mountain today, I can make a comparison there. 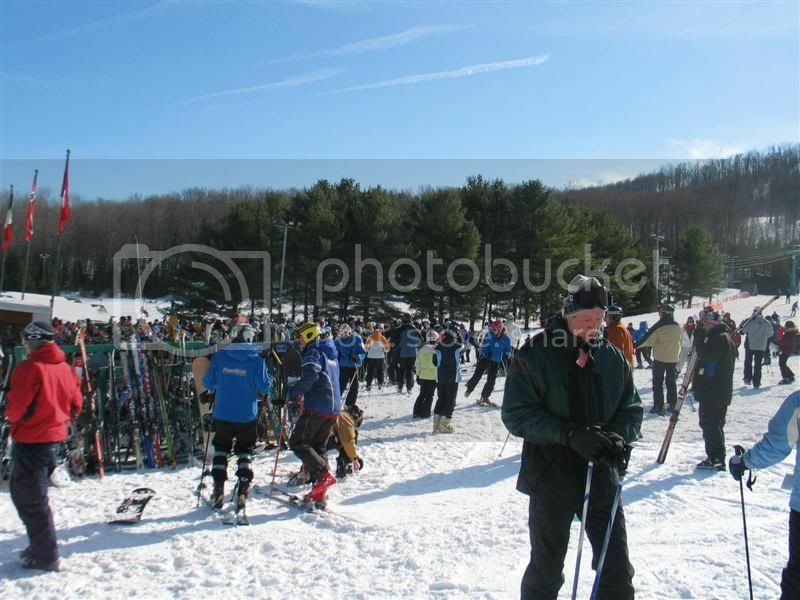 Elk is definitly a “skier’s mountain”, and very much cater’s to the intermediate and expert skiers (although they do offer a “beginner’s pass” for much less than a regular priced ski pass, but limits you to only the beginner terrain, but can be upgraded. A nice way to let beginners to enjoy that mountain that will not want to ski the “hard stuff”, plus helps keeps some beginners off the expert terrain). Also, Elk seems to have a more “old-timey” feel to it, were as Sno Mountain seems to be a more modern ski area. The lodge at Elk is very nice, as well. I hear the one at Blue Knob is a real dump. As to comparing to say, Massanutten, an area that I am very initmatly familiar with, well Massanutten has a bit of a vertical as well as altitude advantage (the summit of Elk is around 1,980, whereas the summit of Massanutten is something like 2,920), but how I wish they could get more terrain to go with that verticle. 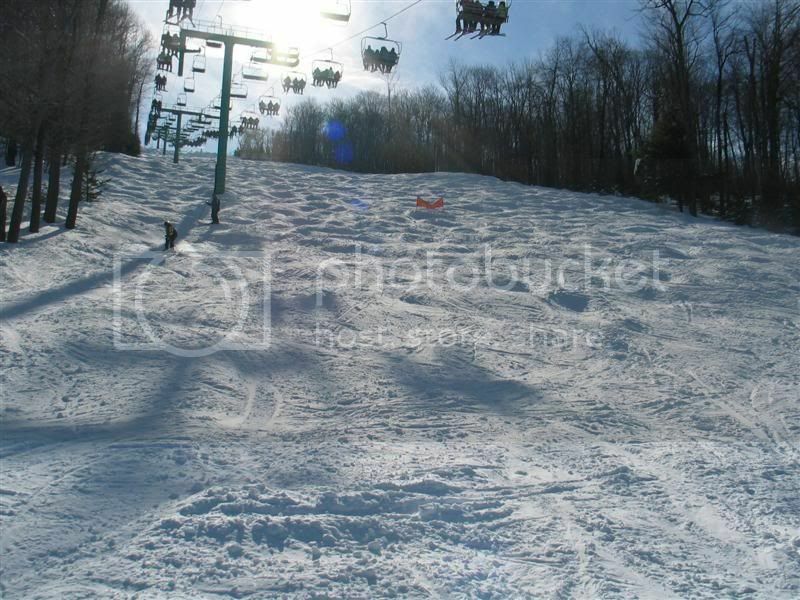 I’d love to see some truly steep runs at Massanutten as well as a good mogul field. Massanutten could also use a good long winding green cruiser like Elk Mountain’s Lehigh run. Does it feel like a solid 1000 vert? I thought it did! Some of those runs, especially the longer blue runs seem to go quite aways and takes a good long time to get down. Even going down one of the more “straight-down” type runs like Sesquahanna, by the time I reached the bottom of the lift, my thighs were burning. & They have been planting norway Spruces by the thousands for years up there. All I saw in the picks were small ones scattered thru the tree border ares…Were there stands of full grown ones? I completely forgot about the norway spruces, but they do have stands of full-grown ones. I did not even think to take a picture. For example, they have full-grown norway spruces up along the two doubles that takes you up over the Seneca run (which runs under the chair). It is actually pretty cool skiing back down through there. 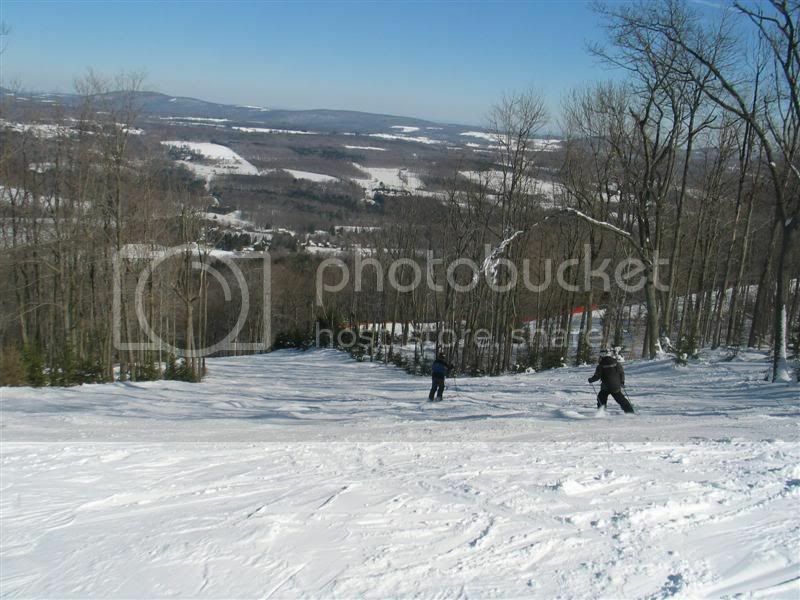 Elk Mountain really is a beautiful ski area, with some wonderful terrain. I hope to hit it again when it is not so friggan crowded.